Use the back button of your browser to return to this page. outside of Bergen, Western Norway. is situated at 051259E/602656N.The close down of the original station was Nov.1st, 1978 at 15 Minutes past Midnight. We home in on LKB from the air. The LKB and LLE station seen from outside. The LKB and LLE station seen from outside,II. The famous original LKB transmitter hall stands deserted as it was at the sign off with sole Telefunken 20kW unit of this kind left. The new LKB Philips 10 kW transmitter from 1965 is now at LKA Vigra. LLE:The 1kW Marconi used for local programs on "Bergen Lokal" 1115 kHz until spring 1966. The Southern LKB tower at Frudalsmyrene, Erdal. Station was formerly on Longwave and then used 260 and 355 kHz for its two channels, one relay of Oslo program, and one local, called Bergen lokal or Bergen II(LLU). This closed in 1966. 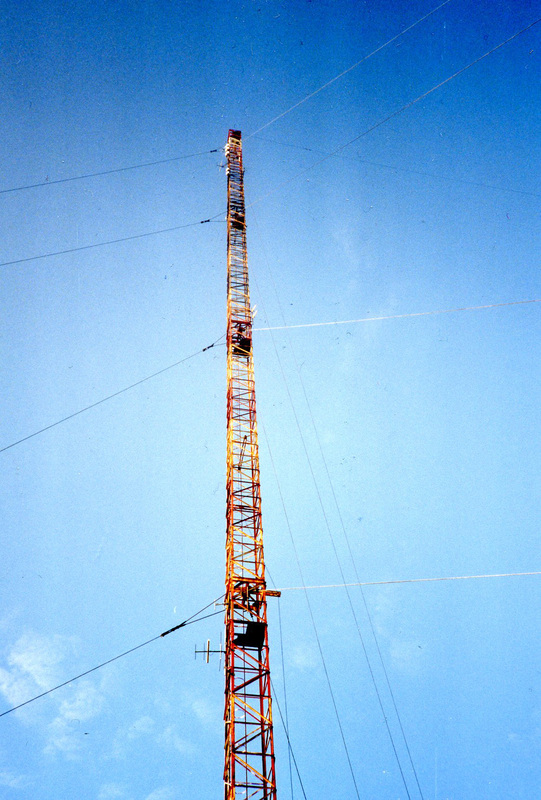 The Northern LKB tower also radiated on 890 and 1115 kHz until it closed for good. AT unit,including feeder cable of Utility Longwave station that operated from site on 438 kHz during the later years. Auxillary tower once used for local radio on FM 106.4. Towers are taken down. Seems to be the sad end of LKB in November 2000. The old mixing table from 1938. "Svennm", Founder of Northern Star Media Services AS and co-founder of FBK at LKB, August 1993. A 250 Watt Western Electric WE 451A-1 is also on the LKB site now used on 1314 kHz for cousin station Bergen Kringkaster. This is the former LLU used at the outskirts of Odda on 1466 kHz(earlier 1115 and 1348 kHz) as a local relay for this inner Hordaland industrial town. LKB Bergen Broadcasting Station closed down for the last time in service for the NRK on 890 kHz November 1st, 1978 at 0015 hours. LLE "Bergen Lokal" on 1115 kHz had then been closed for 12 years. In the 1980s, Bergen Broadcasting Station was used as transmission site for local radio (two regional radio networks in Bergen municipality on 103.5 and 107.8 Mhz, from broadcasting mast), and in the 1990s also Radio Askøy 106.4 Mhz from its own mast). Also in the 1990s, Kongsberg Navigation leased the site for utility transmissions on long wave 437.6 kHz. Bergen Broadcasting Station is preserved as a heritage site since 1999, but in 2001 the two transmitting masts were taken down. The site is owned by Askøy Municipality since 2004. The municipality restored in 2015 20 metres of one of the original antenna masts. Bergen Broadcasting Association (FBK), which was founded on the 2nd of February 2009 is leasing Bergen Broadcasting Station in Askøy Municipality. Odda transmitter (callsign LLU) which closed down 1 / 11-78 now stands at Bergen Broadcasting Station with the Geilo transmitter (callsign LLT) that closed the same day. Odda transmitter was re-started by FBK 9 / 11-12 on 1314 kHz with callsign LLE-2. As antenna is used both a 15 meters Comrod, and earlier a "double L". Shortwave broadcasts started 2 / 9-13 of FBK on 5895 kHz, with callsign LLE-3. As the antenna is used an "inverted V". A medium wave transmitter no.2 initiated by FBK 15/7 2014 1611 kHz, with callsign LLE-4. As the antenna is used another "inverted V". FM broadcasts started 6 / 11-14 of FBK on 103.8 Mhz, with callsign LLE-FM. As the antenna is used an omnidirectional VHF antenna. Transmissions (2 different program streams) has from the start been licensed by NKOM (Post and Telecommunication Authority) and from 2016 also by the Media Authority. Bergen Broadcasting Association is using callsign LA1ASK for amateur radio activity at Bergen Broadcasting Station with main frequency 3702 kHz. Picture:Norwegian AM transmitter site LKB at Erdal, Askøy Island. Twin 150 metre masts were taken down fall of 2000. This picture shows the Southernmost tower as it was in 1993. All rights reserved: Northern Star Media Services AS © 1993-2016. In 2009, Foreningen Bergen Kringkaster leased the site from Askøy Municipality for 10 years.